Sweet diamond cuts is a tasty and easy to make evening snack. I made this snack for my Son's birthday party and every body loved it for the healthy version. Instead of preparing completely in All purpose flour/Maida I have used half wheat flour and half Maida. 1) Grind sugar to fine powder using a dry mixer and keep aside. 2) In a mixing bowl add Maida, Wheat flour and mix well. Next add Cardamom powder, Ghee, Sugar powder, Salt and start kneading by sprinkling water little by little. The dough should be soft like chapathi dough. If the dough is tight sprinkle few more water and if it is loose add more flour. 3) Cover the dough and set aside for 20 mins. After 20 mins, knead it again. Pinch few dough and cover the rest. 4) Roll the dough to thin circle by dusting flour when required. Now cut the rolled dough using a knife to make horizontal and vertical lines to form small diamonds. Separate them and keep aside. 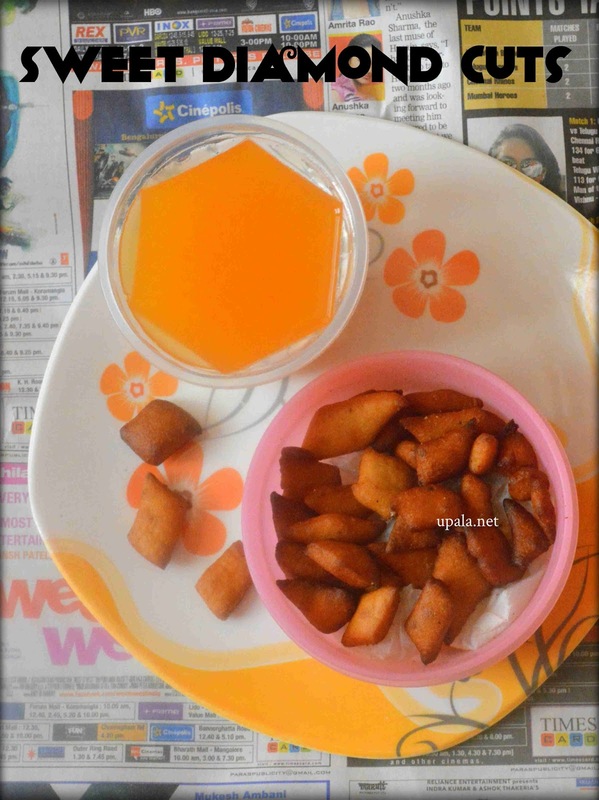 5) Heat oil in a kadai, now pinch a small dough and drop it in oil. If it raises to top immediately then oil is in correct temperature. Now drop the small diamond cuts in sprinkling way so that they will not stick to each other. 6) Cook the diamond cuts in medium flame, after one side has turned light brown turn it around to cook other side. 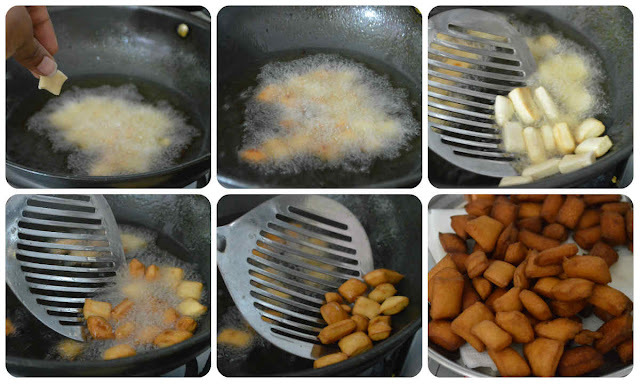 Once they turn golden brown, remove from oil and drop it on paper napkins to absorb excess oil. 7 ) Repeat the same procedure for remaining dough. After the diamond cuts are cooled store it in an airtight container and much them as evening snack. 1) As we are adding wheat flour, you will get little dark brown in colour. 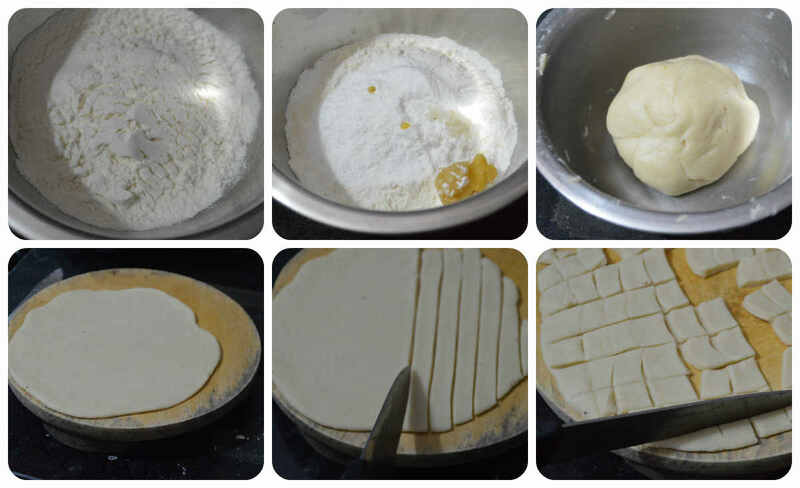 As per your choice, you can do these biscuits fully in maida by skipping wheat flour. 2) You can also add 2 pinches of Cooking soda to flour. 3) You can skip adding sugar powder to flour and add it finally after frying and when diamond cuts are still hot. In this method, sugar will get coated externally and gives more sweet taste.